Royal Dutch Shell sat out previous waves of energy consolidation. Now the Anglo-Dutch major has struck the first megadeal of the latest oil rout. Paying $70 billion for smaller, gas-focused rival BG looks like a smart and opportunistic way to boost growth. Shell admits eyeing BG for years. The deal looks well-timed: a series of profit warnings and management changes made BG vulnerable, with new Chief Executive Helge Lund only taking over in February. At first glance, though, this looks better value for BG shareholders. A fat 50 percent premium equates to a total mark-up of nearly $23 billion. That outstrips planned annual savings of $2.5 billion: taxed at BG’s 37 percent rate and capitalised at 10 times, these would have a net present value of closer to $16 billion. However, there may be plenty of extra savings that Shell has not quantified yet. And BG’s depressed share price might overstate the real premium – the stock has plunged 28 percent in the last nine months. Moreover, the strategic argument is compelling. BG will boost Shell in two complementary areas: Brazilian deepwater assets and liquid natural gas. Shell, which has a lacklustre reserve-replacement ratio compared to peers, will see production lifted 20 percent. As ever with megadeals, much depends on execution and keeping costs down. Given BG’s recent troubles, this may not be straightforward, although the company’s capital commitments are falling as it completes large projects. There is also an in-built optimism behind Shell’s move. BG will add to cash from operations in 2016 and will be strongly accretive to earnings per share from 2018, Shell says. But it is assuming that by then Brent crude has recovered to $90 a barrel, some 50 percent higher than today’s price. If it doesn’t, Shell will need to find a sharper axe. 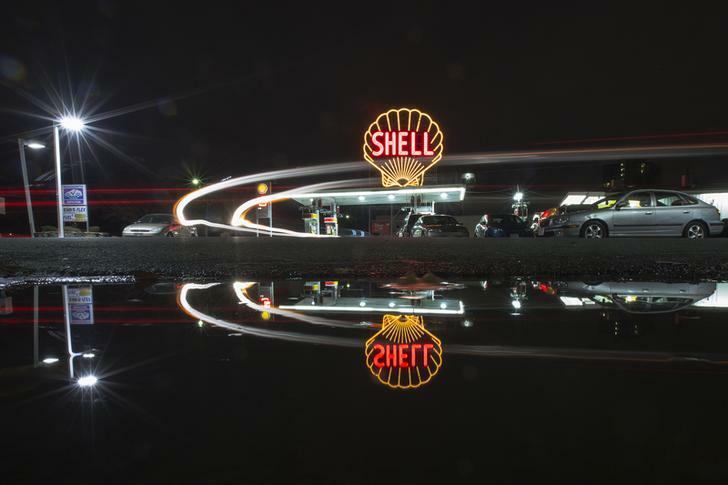 An illuminated vintage Shell sign is seen reflected in a puddle at a Shell gas station in Cambridge, Massachusetts, December 12, 2014. Royal Dutch Shell agreed on April 8 to buy rival BG for 47 billion pounds ($70 billion) in cash and stock, a 50 percent premium to BG’s last closing share price. BG investors will receive 388 pence in cash plus 0.4454 “B” shares in Shell for each BG share. That values the British oil and gas company at 1,367 pence per share based on the buyer’s April 7 share price. BG shareholders will own 19 percent of the combined company. The deal, recommended by both boards, will add 25 percent to the Anglo-Dutch major’s oil and gas reserves, and 20 percent to production. Shell expects to reap $2.5 billion in annual pre-tax synergies. Pro-forma gearing will be about 20 percent of the combined group’s capital, and asset sales will increase to $30 billion between 2016 and 2018. The companies expect the deal to close early next year after regulatory approval. Shell expects the deal to add to cashflow from operations per share in 2016. It will “mildly” boost earnings per share in 2017 and “strongly” lift EPS from 2018, Shell said. BG shares rose 37.5 percent to 1,252 pence at 0824 GMT. Shell shares were down 2.9 percent at 2,032 pence.